May 2011 Giveaway Winner Announced! I have just sent you an email that you are the winner!! Andrea Dow will send you your Fearless Fortissimo pdf soon. Today I wanted to share a photo from my university’s Community Music School recital a few weeks ago! This is one of my wonderful students who I unfortunately must leave behind now that we are moving. :( I will miss all my students! My fellow teachers and I bought roses to give out to all the students who performed that evening. It was so fun to watch the students faces as they each received their rose and gave it a big sniff. They felt like real performers! In other news, my husband and I finally have living arrangements in Ohio! We will be renting a cute little three-bedroom house. It will be so exciting to set up my piano studio……but first we have to deal with the great fun of packing and moving. We will be staying with family for a few weeks until the landlords finish a few last-minute projects inside the house. By the middle of June, we hope to be totally moved into the new place. 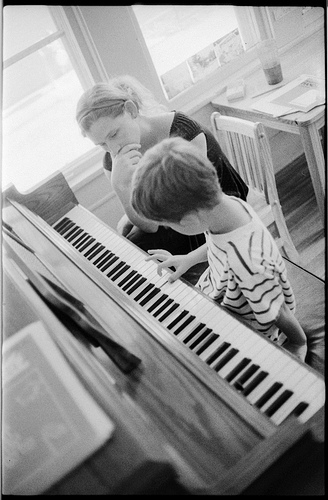 Forum Q&A | How Did You Become A Piano Teacher? How did you start teaching piano? Who was your first student? Who inspired you to be a piano teacher? Did you always know you would be a piano teacher? Did you have a mentor? What kind of piano did you teach on? I’ve also begun looking into advertising piano lessons, since I will definitely need to do some of that in order to find new students. 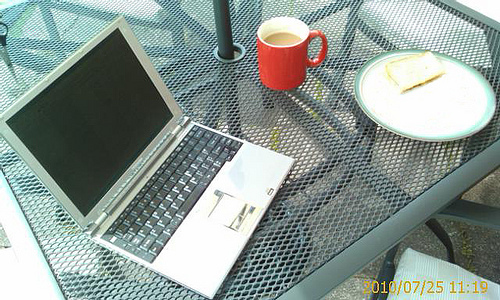 I’ve found a number of free ways to advertise online, and have compiled a list of links below. The first step to online advertising is definitely to create a website for your piano studio. If you haven’t already, I would recommend checking out the user friendly Weebly.com. If you have a studio website already, then you are ready to try out the links below! I recently discovered that local businesses can create their own Google Places page for completely free. Click here for a very nice example of a Google Places page. You can click here to get started listing your own studio business. In the last month, a bunch of blogs have come to my attention — and I’d like to share them all with you here today! Check these out. 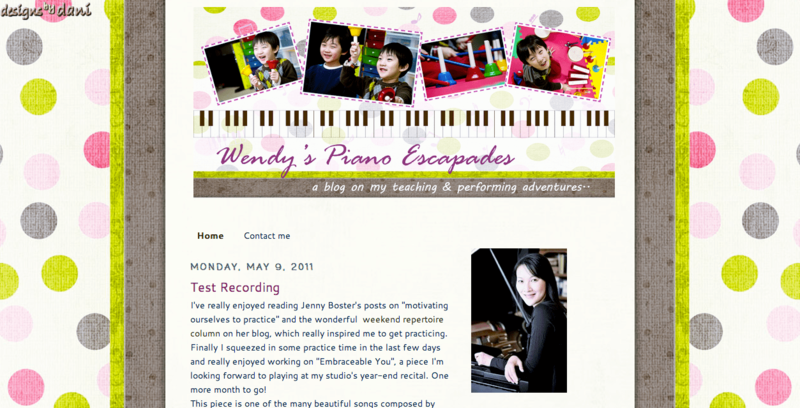 Piano Escapades | Wendy Chan is a creative piano teacher who posts colorful printables and shares ideas. This is a must see. Miss Luba’s blog | Luba has a great writing style that is straightforward and down-to-earth. Her posts are a real pleasure to read! Last week, we talked about the logistics of having group lessons — how often, how to schedule them, etc. — and we received a few great responses. Thanks so much!! What kind of activities can be conducted during group lessons? 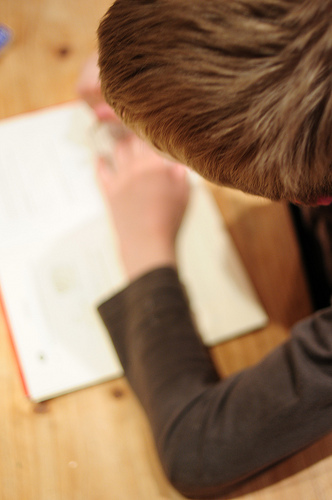 Do your students have a favorite activity? How do you decide what to cover each week? What benefits have you seen from holding group lessons in your studio? Please share your tips and ideas in the comments below! 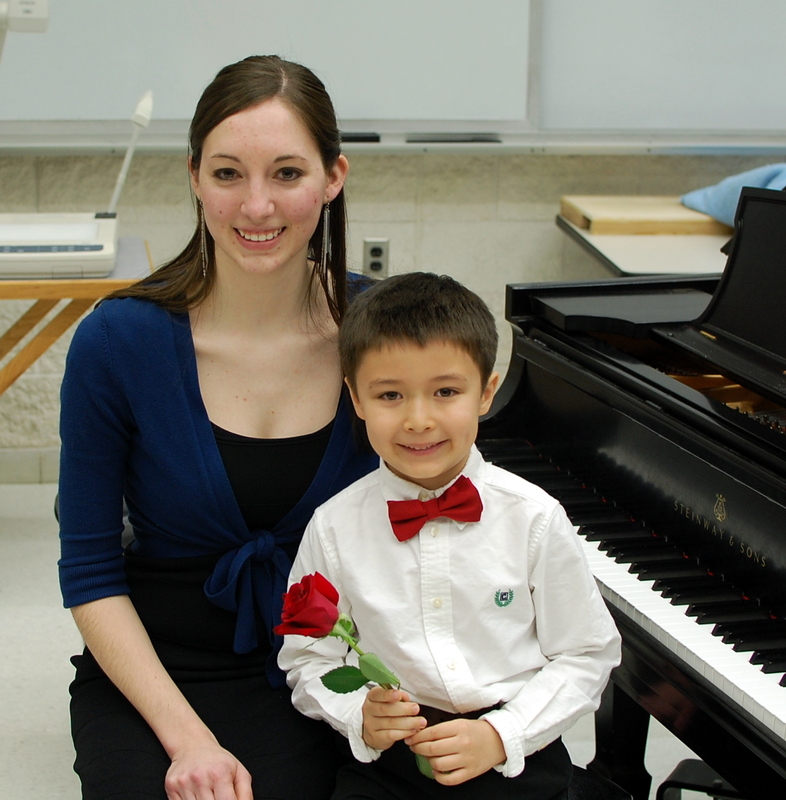 Have you held your spring recital yet? If you haven’t, here’s a new recital program template you are free to use if you like! I currently have two recital templates on my Printables page and they are very popular downloads. This one is in color, although it still looks pretty good in black and white if you plan to print it that way. 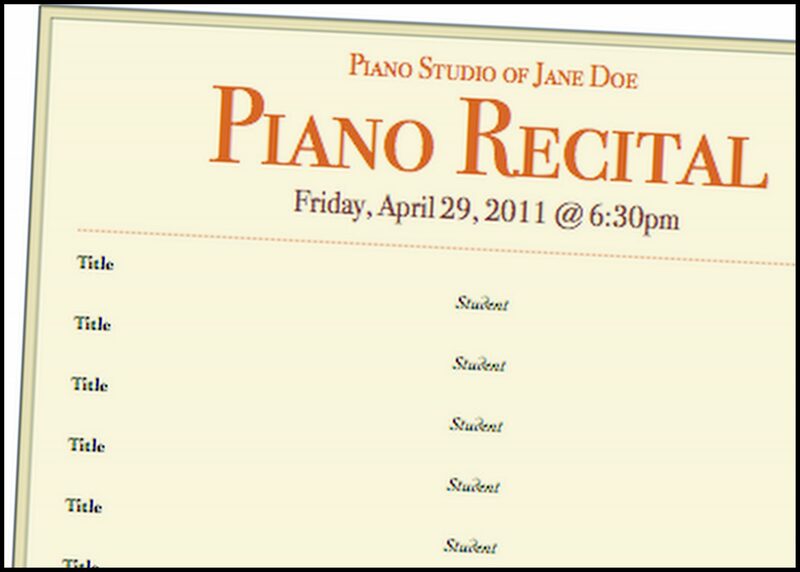 To download: Visit the Printables > Other Resources page and scroll down to “Piano Recital Program Template #3.” I saved it as a “docx” this time, and I hope you all are still able to open it even if you don’t have the latest version of Microsoft Word. Please let me know if you run into problems. If your spring recital has already occurred, how did it go? I’d love to hear all about it! Today I have a fabulous interview for you, from a husband & wife team who runs a 350-student music school in Canada! 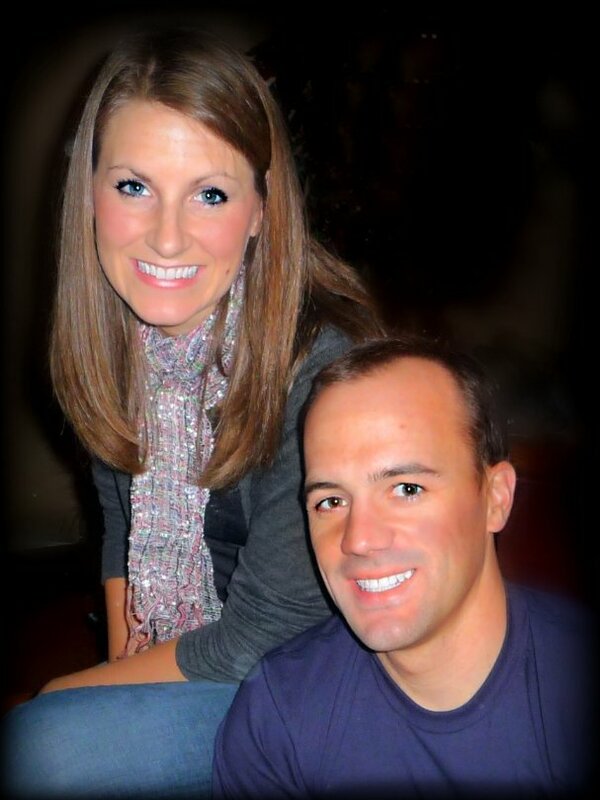 Meet Andrea & Trevor Dow. 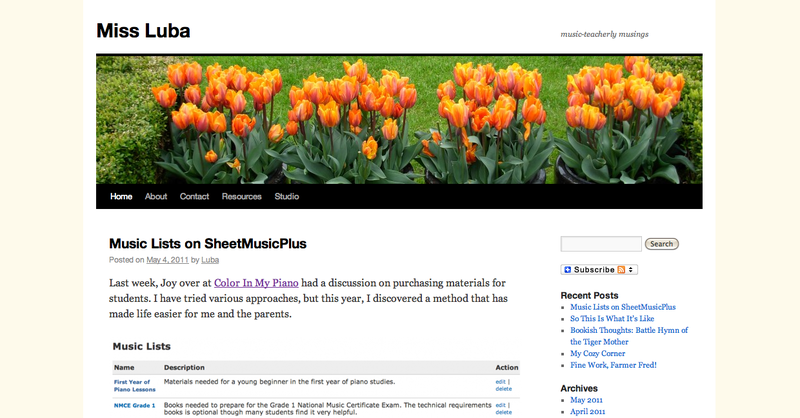 The website for their music school, Wildflower Music Studio, can be viewed here. Their latest project has been to write a series of piano music intended for boys. The series of “episodes” is accompanied by comic book illustrations that tell the adventures of Fearless Fortissimo. Joy: Please tell us about your piano and/or teaching background! Andrea: I was heavily involved in piano and singing lessons from the age of 4. I started teaching piano lessons when I was 18. I had a rusty old Toyota Corolla packed with supplies and I drove to my students’ homes in between my university classes and on weekends. This quickly morphed into a full-time job when I graduated with my B.Mus and within three years I had a studio of 350 students and a teaching staff of 14. My husband, Trevor, and I created the Piano Pals Early Learning Program (a preschool piano program for students ages 3-5 that teaches both beginning piano skills as well as kindergarten math concepts), which has been extremely successful at our own studio and is currently in development to be available to other teachers online. Right now I teach upper-level piano and singing lessons while managing our studio, and together with my husband we create online materials for piano teachers with the goal of bringing them the same amount of success we have created with our own studio. We co-authored the teaching e-book “Piano Hands Shouldn’t Flip Burgers” last year, are active bloggers, and most recently launched our newest venture with www.pianomusicforboys.com.